I tell you what I don't trust: stairs, because they're always up to something. But talking of not trusting people, President Trump woke up this week to discover that one of his loyal inner circle had anonymously written a column in the New York Times that was the editorial equivalent of Gordon Ramsey going berserk in a badly run kitchen. This came just one day after scathing excerpts were published from yet another anti-Trump book, this one written by Bob Woodward who was of course famous for reporting on the Watergate scandal which also prominently featured a hotel. So who wrote it this editorial? 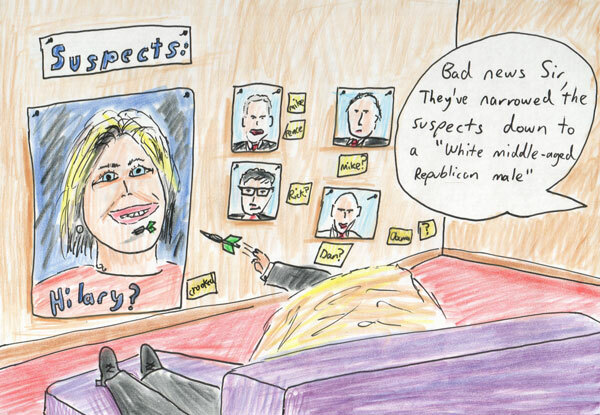 Suspect number one is vice president Mike Pence, who would inherit the oval office were Mr Trump to be ousted. Pence has in the past repeatedly said that he has no ambitions to run for the presidency in 2020 although at the same time he never formally ruled out making a move for it in 2018. Also in the lineup are Rick Perry, Mike Pompeo, James Mattis, Dan Coats, Jeff Sessions, Rod Rosenstein and of course Colonel Mustard with the candelabra in the billiard room. Or for a more American translation of that, Sergeant Tabasco with the flashlight in the den. Because right now all anyone can do is make silly guesses; there isn't any evidence to go by other than some analysis of words and sentence structure that makes palm reading look like quantum mechanics and Mystic Meg look like Marie Curie. You may as well have a go at guessing who the next Dr Who will be, except that in this case it's all white men over the age of 50 so no luck there. Finally two other stories this week: Boris Johnson he's been so keen practice Brexit that he's done a trial run by splitting from his wife, he's apparently drafting up a divorce agreement that gives him full access to the wife, not having to hand over any money ever, and a conditional clause allowing him to share any subsequent girlfriends with Nigel Farage, but definitely not Michael 'Judas' Gove. Also, car chase film star Burt Reynolds passed away this week. My favourite film of his was that one with the French car factory exploding into flames, oh wait not, that's Burnt Renaults I'm thinking of.